Maccaferri Central Europe was a technical partner to the D3 Svrčinovec –Skalité transportation infrastructure project. The transportation infrastructure construction of the reinforced soil structure on the tunnel portal “Poľana” is proceeding. Maccaferri was a primary contributor and facilitator of the project, especially regarding two locations of the D3 Svrčinovec – Skalité. 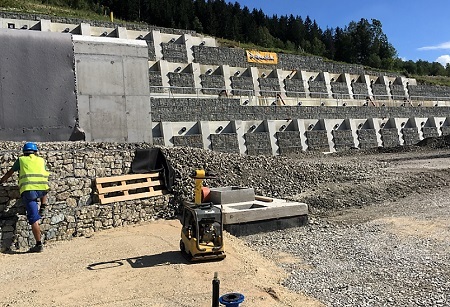 In the first area, two stages of gabion cladding were installed at the Poľana tunnel portal. The gabion cladding is formed from 0,5m thick gabion monoblocks made out of double twisted steel wire mesh with a 6×8 opening, wire 2,7 mm/3,7 mm with Galmac + PVC polymeric coating. Maccaferri gabion baskets are made from high-quality steel wire, which is heavily galvanized to provide long-term corrosion protection. An additional protective polymeric coating is also applied for gabions that are to be used in more aggressive environments, or where a longer design life is required. This is installation was completed successfully. In the second location (see picture), Maccaferri provided a reinforced soil structure for the Poľana tunnel portal. The portal is built from Terramesh blocks with an 8×10 mesh, wire 2,7 mm/3,7 mm with Galmac + PVC polymeric coating. The Terramesh system, patented by Maccaferri, achieves outstanding results regarding slope stability without “choking” the ground. Terramesh features geogrid soil reinforcement with an integral fascia system and is used to reinforce soil slopes, making them stand steeper, accommodate greater loads and settle less. Maccaferri not only provided its solutions but also contributed to constructing the solution. Our team launched training on the job site, provided an installation manual and answered numerous questions from the construction company. Since its completion, the project has been featured several times in news such as the one published on June 15th. The project continues to hold its ground efficiently. Maccaferri proved its ability to provide, deliver and install its solutions, thus significantly aiding construction procedures.